DPS Trooper Chis Stanbery and Deputy Lee Rogers investigate. 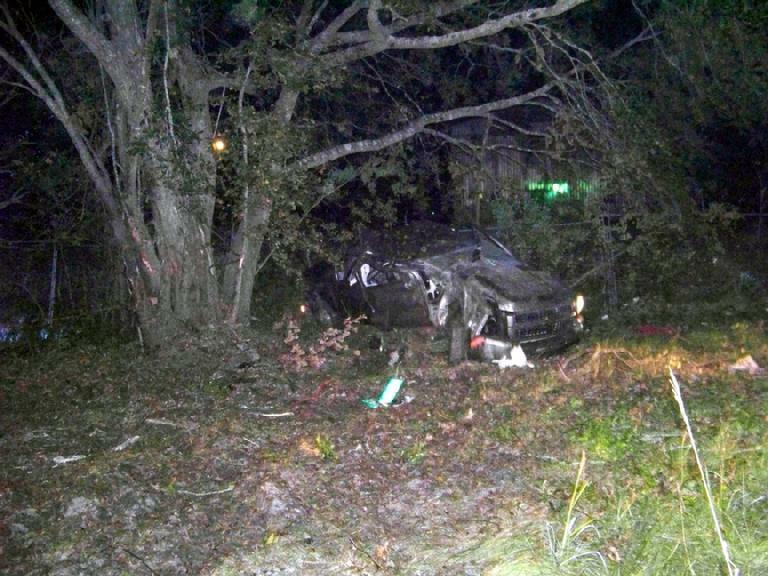 Multiple Roll Over Accident Hospitalizes Man with Serious Injuries, GOODRICH, November 4, 2008 - Shortly before 12:30 am on Tuesday, November 4, 2008, a gray 2008 Chevy Silverado Z-71 Diesel driven by Lauren David Hill, 28, of Goodrich was south-bound on FM-2969 when he entered a curve and his truck left the road to the left where it slid on its side and rolled several times, slammed into a tree, spun around, and came to rest upright facing west. Hill was ejected during the rollover. Polk County Sheriff's Deputy Lee Rogers was the first responder on the scene and found Hill in the grass with serious injuries. An Ambulance from Americare Ambulance Service arrived and treated Hill before transporting him to Hermann Hospital it Houston. 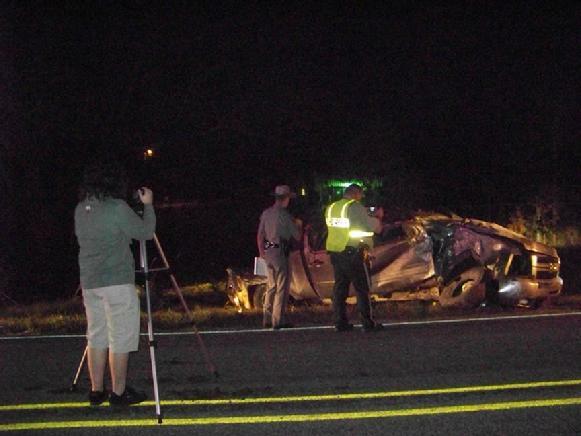 Life flight was preferred, but fog prevented helicopter flight. Shortly after Deputy Rogers arrived, Deputies Craig Taylor and Billy Duke arrived to assist. DPS Trooper Chris Stanbery was dispatched to the scene to investigate. Also at the scene was the Goodrich Volunteer Fire Department led by Fire Chief Kenneth Hambrick. There was a smell of alcohol coming from Hill and from Hill's vehicle. Citations could be pending based on the results of toxicology reports. A rollback wrecker from Ken's towing arrived to recover the totaled truck, and it will be stored at Harrison's Body Shop in downtown Livingston. The scene was cleared shortly before 2 a.m. The cause of the accident remains under investigation. Hill's truck came to rest beside the tree that it slammed into.